Tokyo Tower is a communications and observation tower in the Shiba-koen district of Minato, Tokyo, Japan. At 1,092 feet, it's the second-tallest structure in Japan. The tower is an Eiffel Tower-inspired lattice tower that's painted white and international orange to comply with air safety regulations. 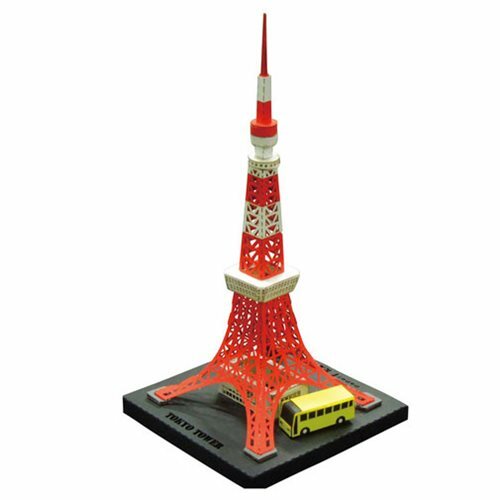 Take your papercrafting to the next level with this Tokyo Tower Paper Model Kit! Laser-cutting technology allows you to build this world-famous structure in more detail than ever before, and with a finished size of 3 5/8-inches tall x 3 5/8-inches wide x 2 3/8-inches long, it's the perfect display piece to show off your papercrafting skills! Detailed color instructions and a folded display case included. Ages 12 and up. Paper Nano models are made of laser-cut paper. Carefully punch each piece out of the labeled cards. Then curl, fold, and attach with tabs or glue as instructed. Be patient and have a steady hand! Suggested tools for the build include tweezers and an X-Acto knife. Keep some clear-drying glue on hand, and possibly a toothpick for application. Includes pictorial build instructions. Tools and glue not included.